Material:This durable dog vest harness is made of scratch-resistant oxford material (100% Polyester) to prevent against wear-and-tear. Light: Lightweight mesh lining with soft sponge padding in the chest keeps your dog comfortable on their walks and prevents pulling. 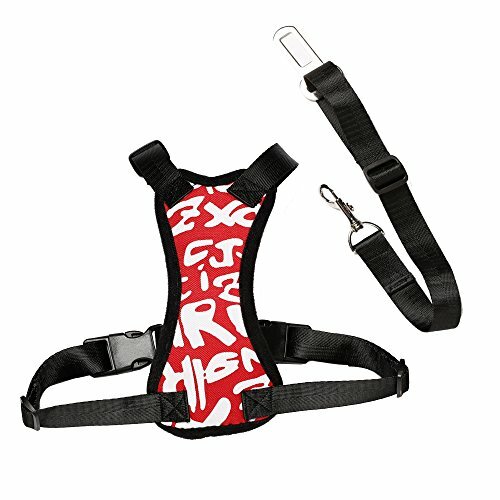 CONVENIENT to Wear: The adjustable straps allow for a custom fit to make your pets as comfortable as possible. Safety: Keeps your pets safe in case of a sudden stop, and keep them from distracting you when driving. Note: This dog car seat belt suitable for most cars, but NOT fit for Kia Niro, 2011 Jepp Wrangler and 2013 Honda Pilot. Please measure your pet before you purchase. Take each measurement a bit loose, so there would be room for your pet to move and breathe, but not too loose.